I was so happy that tonight I was able to use fresh herbs from my herb garden for my dinner recipe. My herbs are doing better than I expected and will save me so much money this summer. Growing my own basil is one way that I know that I will save money since I use basil at least once a week for dinner. The herbs available at the grocery store are over priced and start to brown by the time I am able to use them. Being able to just go out and cut the amount that I need is so nice. Plus the flavor is noticeably better than store bought. One food I love adding fresh basil to is burgers. It can take a regular burger from ordinary to something memorable. Last week I tried a new recipe for Tuscan Turkey Burgers from Redbook magazine. This recipe has 10 ingredients. It takes 30 minutes of total time, 10 minutes of which is active and makes 4 servings. I did make a few changes to the original recipe. First since I eat gluten free I made gluten free biscuits and then made bread crumbs in my food processor. I also used my indoor grill to cook the burgers, which helped to reduce the fat without reducing the flavor. For my serving I ate the burger between two gluten free biscuits, for the rest of my family I made homemade hamburger buns. These burgers have a tendency to crumble when you try to flip them over so be careful. I actually waited until the next day to take the photo. After sitting in the fridge the burgers were much firmer and easier to deal with. It might be a good idea to place the burgers in the fridge to firm before cooking them. I thought these burgers were great without lettuce so if you are unable to find Boston lettuce you can leave it out. Overall these burgers turned out very moist and were enjoyed by my whole family. 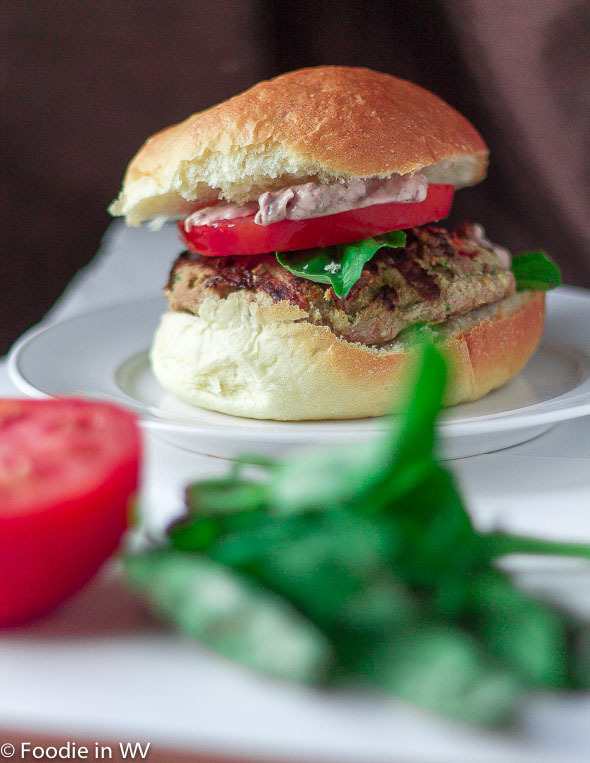 For the recipe go to Tuscan Turkey Burgers. Waiting until the next day to take the picture was a good idea. Did anyone end up heating it up and eating it? Good tip on the refrigeration. The picture came out great, and the burger sounds good. Thanks :) It really does help to let them sit in the fridge to firm up! Can I have this right now?? This here recipe, is the S#$t. At 630 calories a burger, you know it for a heavy exercise day or free day. Thanks for posting a perfect burger for the holiday. I eat healthy 99 percent of the time and cheat the other 1 percent :) It also helps that I literally never sit still thanks to my two kids. The burger really is delicious! Love fresh basil! Just had turkey burgers the other night. So good! I love fresh basil also, it's delicious! Thanks :) They were really good!